Pt.Varaprakashji has undergone extensive academic training in Sri Pancharaatra Agama Pratistantam at the Sri Venkateswara Veda Patasala (Dharmagiri) of the Tirumala Tirupathi Devasthanams and also worked there for 5 years. Well experienced, Pt.Varaprakashji has also worked at the Sri Venkateswara Swamy Temple of Colorado, Denver over the recent years. 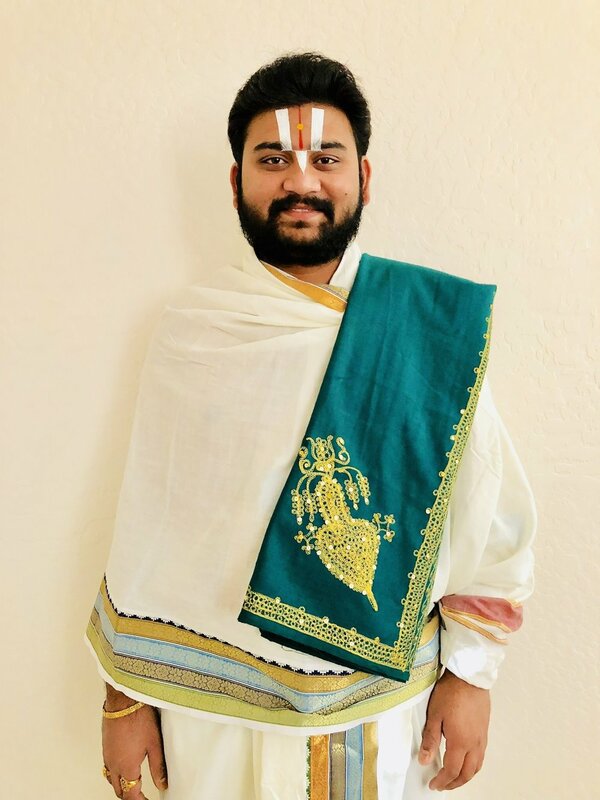 “My mission is to explain and interpret our religious values to our community youth in America”, says our Pt.Varaprakashji. Pt.Varaprakashji is well versed in performing both Temple and at-home rituals. Conversant in many Indian languages, Pt.Varaprakashji is experienced in performing several religious services including Sri Satyanarayana vratam, Srinivasasa Kalyana Utsavamas well as Grahasthasrama Karmas/samskaras, sudarsana homa , Narasimha Homa, Mahalakshmi Homa, bramhostava, pavithrostava, Special Alankaram & Astrology.